Canada has a $31 billion food waste problem, according to recent research. When you add in resources, energy, water and land, it tops $100 billion in waste that builds even more of an impetus to act. Chartwells, a sector of Compass Group, feeds over 1 million Canadian students each day, and hosted the Stop Food Waste Day campaign on campuses across the country today to ensure their guests and associates know how they can help put a dent in this $100 billion problem. Humber College in Ontario is showcasing solutions that aim to inspire a real change, both by educating guests, and changing how menus and kitchens are managed. 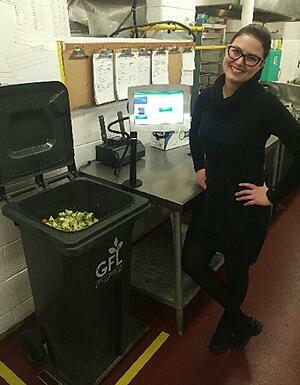 Whether it’s by creating root to stem recipes that leave no waste and taste fantastic, or by piloting technology such as LeanPath (pictured right and above) to help understand and improve processes of food production in a methodical and data-proven manner, Chartwell’s has a goal of zero food waste. Over 50 campuses across Canada are participating in Stop Food Waste Day to build awareness and get as many people involved as possible in taking an active and thoughtful approach to managing their food waste.